It happens to us all. Some sooner, some later. But it happens. Our eyesight begins to fade. It’s an unfortunate but undeniable fact that as the years creep by our health too scuttles away and our eyesight is often the first thing we notice slipping away. 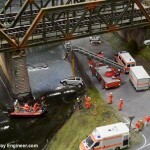 This is especially frustrating for us railway modelers, or model railroaders stateside, who work with tiny objects and for who sharp eye eyesight, or the lack of, is more keenly felt than most. 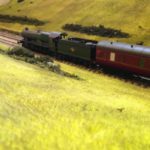 Certainly, the days when I could look at my trains and see every detail my OO gauge fleet in glorious detail have given way to hours squinting at blurred colours. But age needn’t be a barrier. There are lots of aids, from jewelers loops to re-railers, to help but of the many I’ve tried and employ on my workbench there’s one I find myself reaching for more often than any other. 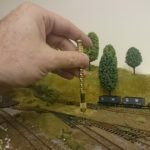 It’s the Fancii LED Illuminated Hands-Free Head Magnifier (or here for readers in the USA, aus Deutschland) and here’s why it’s my preferred magnification aid and I find it so useful for model building. Why do I like it? Well for starters, it’s really well made. It feels strong but isn’t heavy. The arms are solid and not flimsy and the clips that allow the strap to be fitted, instead of the arms, are strong but not so firm as to make releasing them an event suitable for a strongman competition or prone to snapping. Then there’s the comfort factor. I suspect whoever designed this uses head magnifiers themselves and has experienced the discomfort of some makes. I previously used several other head magnifiers. One, in particular, I won’t name it to save embarrassment, was made of cheap black plastic. Now there’s nothing wrong with cheap black plastic — I use it on my layouts for pipework and the like — but put a pair of glorified glasses on your head held in place with a strap of the stuff and you’ll soon realise the downside. Wear it for more than a little while and the hard edges rub and even cut where they touch skin. My temples and ears never got on with it. The strap, also being made of plastic, has no give and ends up rubbing the back of my head. The Fancii model, however, has smooth, contoured, rounded edges with arms that sit comfortably on the ears and don’t continually rub. And if you prefer a strap, there’s one included but it’s a proper elasticated variety that stretches and gives rather than the rigid plastic sort that ends up giving me a headache. Another subtle benefit is that, as already mentioned, the strap is fitted with clips. Other types use a tension knob to secure the strap and while in principle this should work I’ve found that more often than not the knob works lose and need regular retightening. And there’s a nose rest too, made of soft rubber, and again it doesn’t rub or weigh heavy on your forehead. All these subtle design features mean I can wear these for hours at a time and pack in some serious model work without discomfort creeping in. But the biggest win of the Fancii unit over others I’ve tried is the thought that’s gone into the lens element. Many other head magnifiers have their lens built into the plastic of the main assembly. A problem this creates is that not only do they interfere with your glasses if you have them, but they’re also fixed in one position. If you want to look further afield or at an object without magnification, even if only briefly, the whole unit needs lifting to rest on your forehead or taken off completely. This becomes tiring very quickly. With these, however, the lenses sit in a cradle that’s held on a hinge sitting slightly ahead of the main assembly. They sit over my glasses without a problem and when I want a momentary break — to pick up a cup of tea while a weathering coat dries, for example — it’s just a case of pushing the lens upwards out of the line of vision and pulling it back down later. And if you work late at night, as I do when my wife is asleep, and need extra lighting they win here too. And not because they have a light built in. Many magnifiers have this. On these, however, the bright LED (not normal bulbs) are positioned directly above with the lens and can be angled so the light falls precisely where you need it as opposed to just shining somewhere forward. I don’t know about you but my workbench is already cluttered enough with needing one a lamp taking up valuable space and the built-in light in these has meant I put my Anglepoise lamp into storage. Finally, the lenses are crystal sharp. The five different lenses included provide a range of magnification levels of 1.0X, 1.5X, 2.0X, 2.5X and 3.5X and all are clear and sharp. This is, sadly, not the case with many other magnifiers, especially at the cheaper end of the market where the lenses are often low quality and blurred. While not a downside specifically there are some improvements that could be made. It would be great if multiple lenses could be used at once to give greater magnification. Even better would be a flip to then extra lens for those times when you very need brief increased levels of magnification. It would also have been nice to have a greater range of magnification. There are several competitors that offer 6x, 8x, 10x and even 25 times viewing. It would be useful if Fancii offered an additional box of lenses with higher magnification levels. I’d certainly buy it. 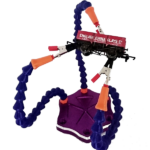 Being able to fit the strap or even a cord and arms at the same time would also be helpful. There are times when I’m using it with the arms in place and take a break and it would be helpful to have them hanging around my neck rather than taking them off completely. While there are plenty of other head magnifiers available, and while some have individual features that are better than the equivalent on these (especially in terms of magnification levels) for me the Fancii head magnifier has the best combination of build quality, comfort, practicality and design I’ve come across. Get the Fancii LED Illuminated Hands-Free Head Magnifier Visor from Amazon or via here if you are in America, aus Deutschland. Full disclosure: No money or gifts were exchanged for this review. 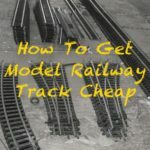 I bought the product at the advertised price via eBay or Amazon without the supplier knowing it would be reviewed on Model Railway Engineer. The links on this page take you to Amazon or eBay allowing you to purchase the product under their affiliate programmes by which I get a commission on any orders placed although the price you pay does not change. One question though. Do the LED lights give off a warm light or the harsh whitish gray light? The lights I have now are the white, cold colored ones. I don’t like that at all. I much prefer the warmer lights of say, an incandescent bulb. I can see much better with the warmer lights. Thanks for the tip Andy. 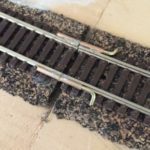 Ordered a pair and used them straight away on repairing a loco that I’d damaged. Clumsy git. I too have found my eyesight getting worse over the years which for me is a bit of a bore because I’m a lens technician in the film industry! Regular eye tests at your optician is a must, and goes with good lighting when concentrating on models requiring close up work etc., eye strain can cause serious and worsening headaches as can tension and posture which is often overlooked. Not for no reason is there health and safety recommendations and just because it’s at home doesn’t mean you can ignore potential health problems! This isn’t meant to sound like a soapbox lecture but we should look after ourselves! thanks for the helpful review. So, do I understand correctly that you can wear them over normal spectacles? Brought a pair of these after reading your review,money well spent,and comfortable to wear.